For a given price-point PCs harness more power than ever before - £999 will, today, buy you a system that comfortably outpaces one of the same price, purchased, say, two years ago. However, all the trickery is contained within the chassis, and whilst the specifications have improved, it's sometimes difficult to ascertain by just how much when pootling around in Windows or playing the odd game. After all, a GeForce 7950 is still a reasonably good gaming card. The one obvious advancement in specs has been with the bundling of ever-larger TFT flat-panel displays with systems. Pay £999 and you should be disappointed not to receive a 22in, 1,680x1,050-resolution monitor. Pay a little more and 24in TFTs, equipped with 1,920x1,200 panels, become the mainstay, and screen prices are dropping such that even a relatively modest budget offers room for a quality display. Knowing that economies of scale, advances in manufacturing technology, and fierce competition have driven down the cost, and thinking of them in isolation, a screen budget of around £250 will buy you an awful lot, then. 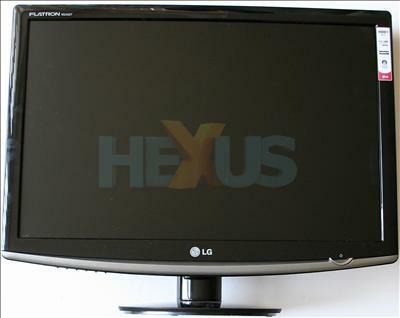 HEXUS investigates just what kind of TFT is available for that money, and whether it's well spent on an 24-incher LG FLATRON W2452T.